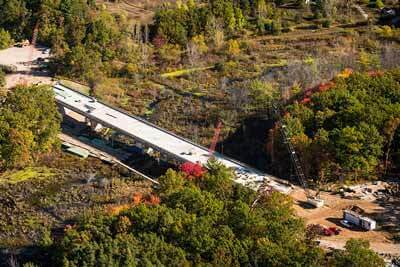 When you do business with Milbocker & Sons, Inc., you can be sure you will receive the most timely and profitable highway bridge construction services in Michigan. Established in 1968, our highway construction company values honesty, efficiency, and superior workmanship, and has a deep concern for on- and off-site safety. Bridge construction remains our well-developed specialty at Milbocker & Sons, Inc. We can expertly handle every aspect of your project, whether it's a major interstate highway interchange, or something as simple as a pedestrian bridge. As your turn key bridge contractor we will manage your project starting with site preparation and pier forming — all the way through placement of the bridge deck and safety railings. Our team of detail-oriented quality control professionals will ensure that your bridge work meets your specifications, while minimizing the impact on the environment. To do this, we continually seek out emerging technologies to improve the quality and efficiency of our bridge projects. Milbocker & Sons, Inc. builds a wide variety of boardwalk construction projects, including wooden bridges, pedestrian bridges, multi-use trail bridges, wooden sidewalks and roadway walks. For starters, boardwalk construction numbers will vary with different applications. One of the first steps in a boardwalk project’s design document phase is determining which foundation type will provide the most value within the owner’s allotted budget. The design and construction of pedestrian foot bridges differs depending on where they are to be situated and how large they have to be. A simple beam bridge is usually used for short spans and a truss bridge is usually required for longer spans. Other design features to consider for pedestrian foot bridges are whether they have their walls closed, either for climatic protection or to protect the road or rail below from possible debris, how access to the pedestrian bridges is gained for example by stairs, or ramps suitable for wheelchair, or both. Lifts may also be needed for further disabled access. To learn more about Milbocker & Sons, Inc., or for more information about our professional bridge construction services for your next Michigan project, or to request a quote, contact us here or call us directly at (269) 673-2195.